The Protect Wisconsin Waterways crew visited the Rock County Farmers Market on June 3rd, 2018 located at a landscape/nursery outside of Janesville, WI. Our representatives engaged with families who share a common interest in sustainable practices. 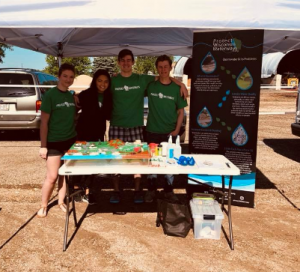 Despite the harsh wind conditions, we were excited to show people the adverse effects of stormwater and what they could do around their home to help prevent these effects. We used the Enviroscape to show event attendees many factors that affect stormwater. After families watched a presentation on the Enviroscape, they received pamphlets with more information about protecting stormwater and our brand. We received five pledges from the 30 attendees we interacted with at the Rock County Farmers’ Market event.